My husband is a dirty man. I mean this in the nicest way possible. You see, much of his work occurs in landfills. Yep, mountains of trash. There, colossal garbage piles are literally covered with dirt and turn into rolling hills. That’s where Mike comes in. He works for a company that harvests the natural gas produced by decomposing trash. It’s a dirty job and would have been perfect for Mike Rowe’s Dirty Jobs show had it not been cancelled. As such, my Mike often returns filthy, especially his clothes. His jeans take a lot of abuse, and it probably comes as no surprise that he runs through them quickly. Sometimes in as little as two months, they are stained, worn, and even tattered to the point that they are no longer wearable. I’m sure the sellers of jeans are thrilled, but I’m not a fan. It’s, well, such a waste. At my house, leftovers are consumed. I plan meals that use excess ingredients from a previous one. I compost, recycle, and am always looking for a way to breathe new life into something old. I’ve found it quite unfortunate that we end up with loads of crappy jeans, which just get tossed into landfills because their wearing days have passed. What a waste of fabric and potential energy. A couple weeks ago, we cleaned out Mike’s closet, and I had a pile to toss. 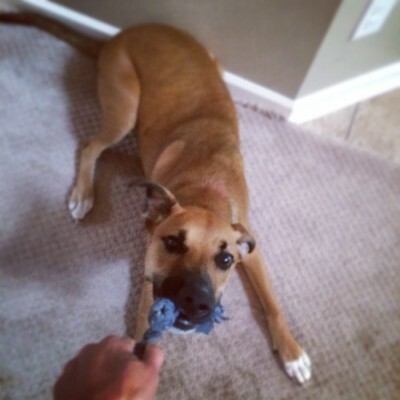 But as I was going upstairs to collect them, I realized that Korra, our 10 month old pup, really needed some new toys and laying before me was a wealth of material we were just going to throw away. Grab some scissors, and cut the legs off of a pair of jeans. (You also now have a worn pair of cutoffs if that is your style, but I digress.) You really won’t even need a whole leg for this rope, but you can go ahead and prep several if you want. Cut up the leg following the seam. Then proceed to cut the entire leg into 3-4 inch strips. The longer the jeans, the longer your rope will be. Mike wears 32” length, and his work fine for a Korra-sized rope. (She’s 70 lbs.) If you want your rope to be thicker, you can cut your strips wider, 5 or 6 inches. I like 3-4 inches because Korra and I can still hold on to it without a problem, and it is easier to tie. Choose three strips for your rope. 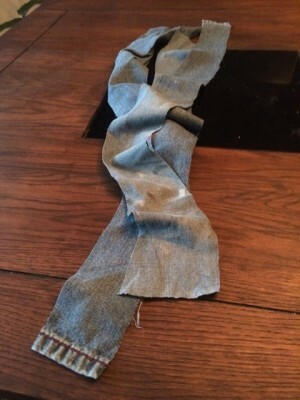 Three strips of old, crappy jeans. 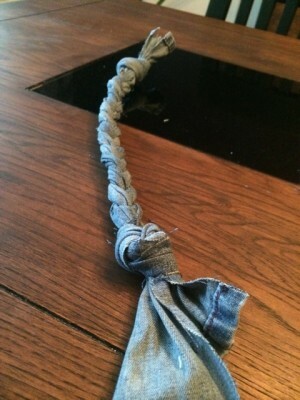 Tie a simple overhand knot to join them. Now, it’s time to braid. 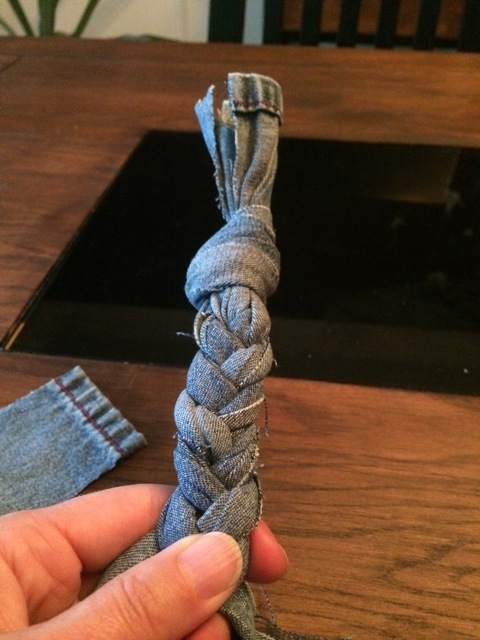 This one is just a simple three-strand braid, but you can add more strips if you want. Keep it as tight as possible. The key to this lasting any period of time is to keep the braid and knots tight. Be sure you are twisting the strips occasionally to ensure that edges aren’t sticking out of the side of the braid. We all know what pups can do with even a little edge or rip. 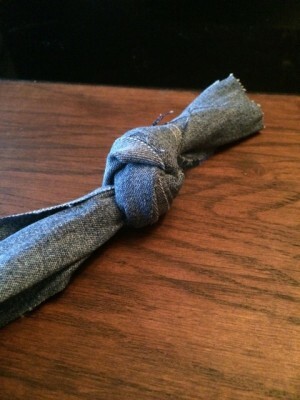 Once you get relatively near the end, tie another overhand knot. Be sure that you don’t let the braid go slack when you do this. 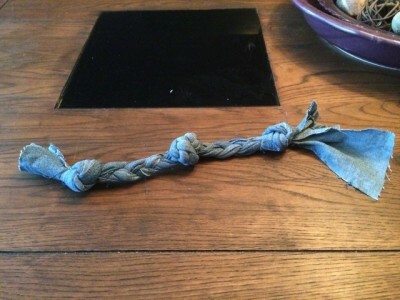 Now you have a nice rope, but dogs do like extra gripping areas, so go ahead and tie another overhand knot in the center of your braid. Pull on both sides alternately to tighten and keep it in the center. And that’s it. Go play! 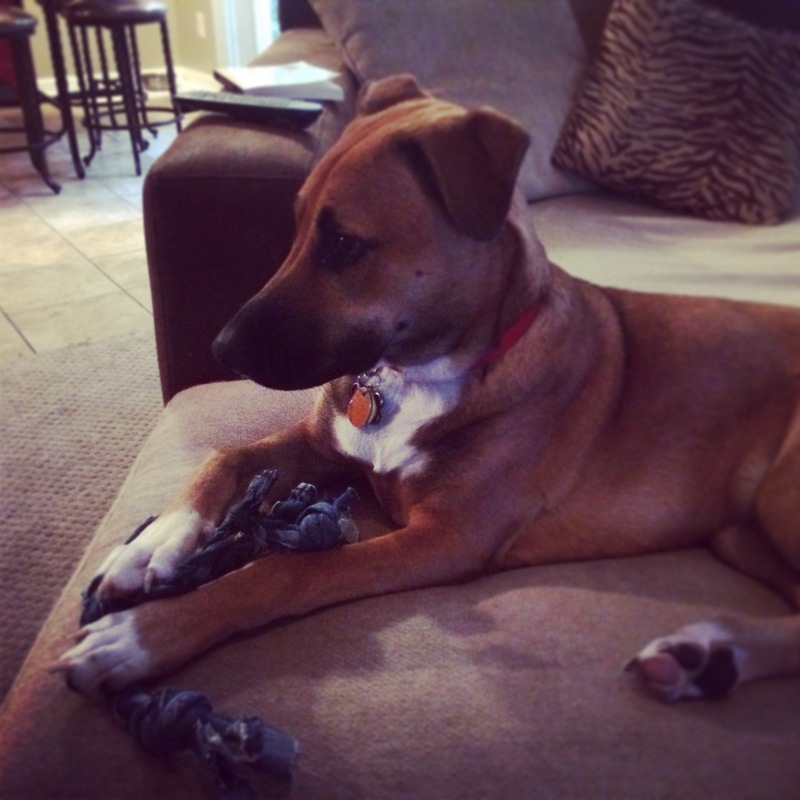 If your dog eats fabric, please do not leave these out without supervision! Play, then put them away. I have a friend from Muay Thai whose dog does this, and she can attest that a blockage caused by ingesting fabric is no fun for anyone involved. Luckily, Korra doesn’t swallow fabric or stuffing. Rather, she spits it out once she’s torn it loose, leaving a field of fiber carnage for me to clean off of the carpet. I just let her shred away. I’ve given it to her after all. 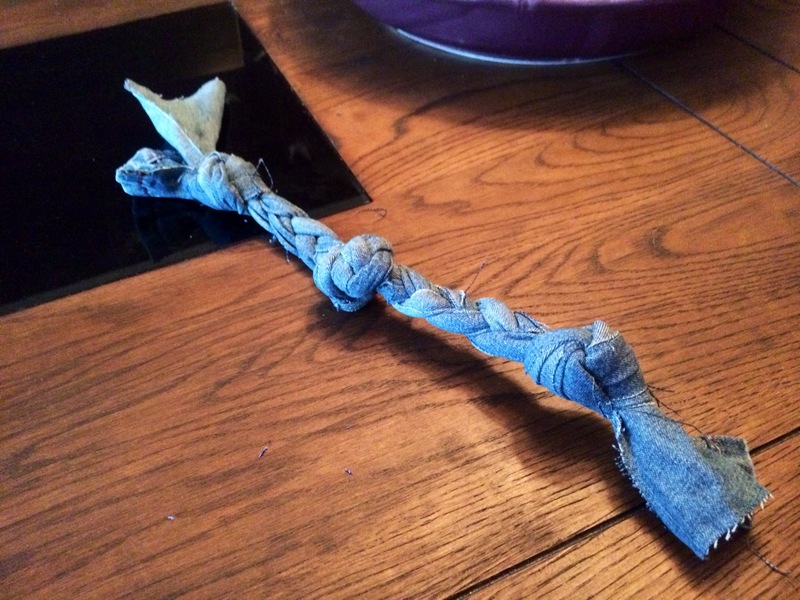 13 Responses to "A Simple Dog Toy From Old Jeans"
Cheryl Ann Coyle liked this on Facebook. Patricia Cavazos liked this on Facebook. I miss my dog Lucky. Bethany Mathews liked this on Facebook. Kierstyn Cavazos Varnum liked this on Facebook. Sue A Johnson liked this on Facebook. Christina Sheldon liked this on Facebook. Deborah Rushen Dunlap liked this on Facebook. Jef Madden liked this on Facebook. Arifuz Zaman liked this on Facebook.